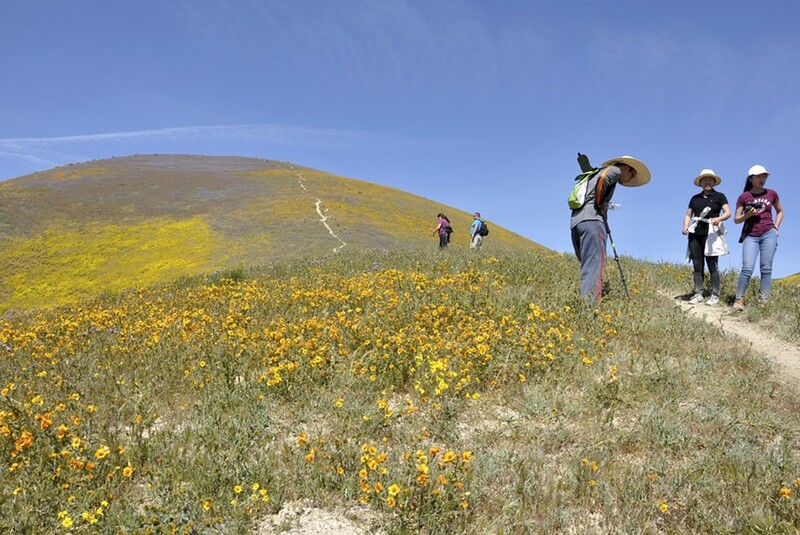 SUPER BLOOM POWER The tourists who invaded the Carrizo Plain National Monument this past spring to view the most vibrant bloom in years have rallied behind the effort to maintain the status quo in the face of a directive from President Donald Trump to review its designation. At about 6 a.m. on April 2, I feel like I'm the only thing awake for miles. Yellow goldfields, tidy tips, and green grass on the Caliente Range across the valley are starting to pick up that special blend of orange and red as the sun's first rays rise behind me. Below, Soda Lake Road is carless, a lone dirt road stretching 37 miles down the center of the monument, connecting highways 58 and 166 in the southeastern corner of San Luis Obispo County. The dust that hung in the air during yesterday's tourist assault on the "super bloom" faded hours ago. It's just me in this place, breathing in the peace I discovered after a chilly night spent blanketed in stars. But I'm a newbie. This largely undeveloped 250,000-acre remnant of the San Joaquin Valley grasslands has always been this way. Archaeological studies show that Native Americans such as the Chumash used the plains going back at least 10,000 years. And for about 100 years, the quiet beauty of the Carrizo was dry-farmed and ranched by families like Steven Beck's. They knew it was special before President Bill Clinton, who designated it as the Carrizo Plain National Monument in 2001, officially declared it so. The wildflowers, endangered species, cavernous stretch of the San Andreas Fault, and weird, white alkali lake were there before people discovered its worth as an environmentally sensitive area that needed protection. "All those things were there; it's just that nobody knew about them," Beck said. "It's just so ironic." He remembers when it was just him, his horse, his cattle, and the wildflowers. For him, the place he called home for so long has definitely changed. He certainly didn't feel that familiar sense of solitude when he visited the monument this spring. "I just couldn't get over how many people were out there," he said. On April 15, Elkhorn Road is a mini highway filled with flower gawkers like me. Here, with views of a water-filled Soda Lake (that doesn't happen every year) and a valley floor that's a sea of yellow (also doesn't happen every year), cars dodge each other along a narrow dirt road, smartphones are out, and Go-Pros are pointed straight ahead. As my nose fills with dust, I'm shocked. Last year was not like this. Even two weeks ago it wasn't like this, but then again, neither was the display from Mother Nature. But as the peak of what a winter full of atmospheric rivers brings started to fade, President Donald Trump signed an executive order that changed the conversation about Carrizo Plain National Monument. On April 26, U.S. Secretary of Interior Ryan Zinke was directed to review the status of at least two dozen national monuments designated by previous presidents under the Antiquities Act of 1906, including the Carrizo Plain. Instantly, Twitter posts about breathtaking blooms turned into pleas to save the monument from losing its protected status. Beck thinks the review isn't such a bad thing—as with business, he said everything should be looked at from time-to-time, even if it's just to ensure that things are working out the way they're supposed to. SEE THE RAINBOW Orange blazing stars and purple/blue phacelia cover the hills of the Carrizo Plain National Monument in carpets of color in April 2017. But Patrick Veesart, who lives on the monument and worked for decades to help protect the land he grew up loving, thinks the review will needlessly stir up controversies that were settled years ago. "I don't know about all these monuments, but I do know about the Carrizo," he said. "What the heck is going to be gained by messing with the Carrizo monument status?" Zinke is tasked with deciding the fate of all national monuments designated since 1996 that are greater than 100,000 acres. That decision rests on whether "the designation or expansion was made without adequate public outreach and coordination with relevant stakeholders," stated a notice for public comment on the review in the May 11 Federal Register. The secretary of the interior will judge if all or part of each of the national monuments under review should return to "local control" before the end of the summer. Written comments must be submitted to the Department of the Interior before July 10. Bears Ears National Monument in Utah is the only one on a faster timeline: Public comments were due before May 26. As for who would be considered a "relevant stakeholder" when it comes to the Carrizo Plain: The Department of the Interior didn't respond to New Times' request for comment, while inquiries placed with the Bureau of Land Management, Carrizo Plain National Monument staff, and the U.S. Department of Fish and Wildlife were referred to a generic email address for the Department of the Interior's public affairs office. According to Veesart, who care-takes an old ranch house and 30-acre parcel on the monument still owned by the Nature Conservancy, the big local controversies that surrounded the monument's establishment included grazing rights and oil development. And both of those land uses were grandfathered in when the monument was established. "There was a very vocal minority of ranchers who didn't want a national monument. They just flat out didn't want the public out there," Veesart said, adding that even now, the public generally only visits when the plains are in bloom. "It's one of those isolated areas of California that never got developed." And that, he said, is like one big happy accident. Because the Carrizo is so desolate and dry, doesn't have a reliable supply of water, and hasn't yielded oil, big ag and oil interests never set down roots. "Because they couldn't find anything to exploit, we ended up with ... a whole list of federal and state-listed [endangered] species out there with no place to go," Veesart said. "It's all agriculture; it's all cities; it's all oil; it's all gone—we've got one little corner of it left, and you know, it seems to me like we better hang on to it." There are more endangered species per square mile on the Carrizo Plain than there are anywhere else in the lower 48 states, said officials from the California Department of Fish and Wildlife—who did return phone calls from New Times. That means quantity of flora and fauna, not necessarily number of species. Those include the state- and federally listed giant kangaroo rat, San Joaquin kit fox, blunt-nosed leopard lizard, and San Joaquin Valley antelope squirrel, as well as Kern mallow, San Joaquin woolly threads, and the California jewelflower. Giant kangaroo rats are considered a keystone animal in this grassy desert ecosystem. The "precincts" they burrow into the ground are used by other endangered species. 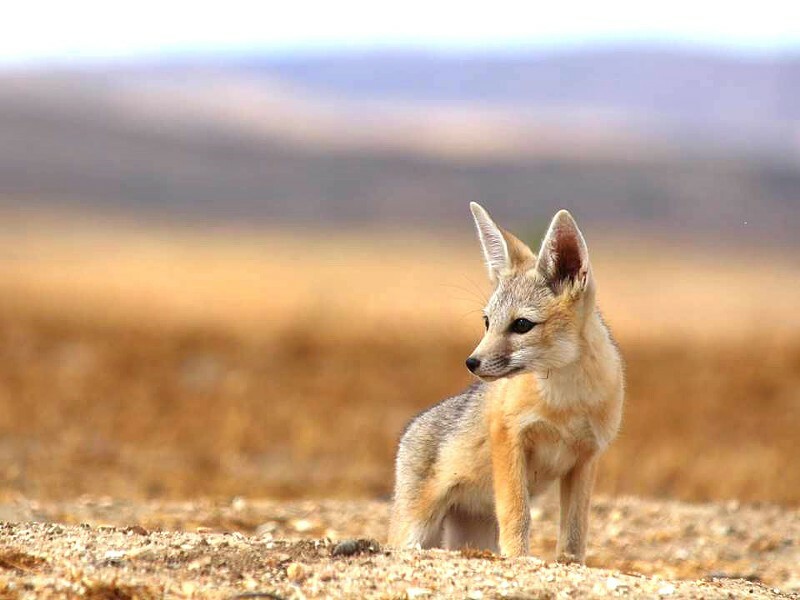 Antelope squirrels and leopard lizards use the hovels, the kit fox eats the rodents, and jewelflowers often grow in the burrow openings, said Bob Stafford, a senior environmental scientist with state Fish and Wildlife who's been doing conservation work on the Carrizo for more than 20 years. "It's hard to find a spot on the Carrizo where you can't find one or the other," Stafford said of the endangered species on the monument. "It is basically the largest representative piece of what used to be the San Joaquin Valley that's left. It's just a big open space." The work being done to protect it started long before Clinton used his presidential power to preserve the land. In the 1980s, the Nature Conservancy and the Bureau of Land Management (BLM) agreed to explore the possibility of acquiring land on the Carrizo to set aside for conservation, according to the monument's official website. The conservancy bought 82,000 acres of Carrizo ranchland from Oppenheimer Industries in 1988, and the BLM received funding from Congress in 1988 and 1989 to purchase 51,000-plus acres. Eventually, that conservation puzzle grew to a quarter of a million acres. The land that changed hands was pieced together from "these ranches that were on the skids," as Veesart puts it. "The Carrizo is a boom or bust environment, but over time, the bust is more than the boom." Beck's family farmed and ranched that land for five generations, starting after the Civil War with a homestead in 1865. He said boom and bust is just the nature of the Carrizo. (Stafford said the more-dry-than-wet cycle affects the endangered species as well.) In the good years, plentiful grass is high and life is good. In the dry years, it's a desolate, hot place to carve out a living. He describes the valley in the 1940s, '50s, and '60s as having a "vibrant farming community." But things started changing in the '70s. "It was difficult economically," he said. "Young people weren't coming back." As technology and transportation opened up job opportunities in other areas, the ranching community got smaller and farmers eventually stopped growing grain on the plains, explained SLO County 5th District Supervisor Debbie Arnold. At the time, she was helping her husband, who was a ranch hand out on the Carrizo. She remembers watching the community change. "I think back, and it was kind of the end of an era," she said. "They spent their whole lives just eking out a living out there; it was a hard life, but it was pretty cool." RAIN FULL Soda Lake reflects the yellow-spotted Caliente Range on April 1, 2017. Beck, now 68 years old, stuck around and started leasing grazing land in 1982 from private individuals. He continued those leases after the Nature Conservancy became a local landowner and even leased land from the BLM after it was designated a national monument. But his lease terms morphed over time, as well as those leases for half a dozen other ranchers. As management of the land changed, cattle became a tool for conservation rather than the land being a tool to produce cattle. "The focus of the cattlemen is not the focus of the critters," Arnold said of the management plan now in place to protect endangered species. Ranchers are only called when vegetation conditions necessitate grazing to benefit the animals that the monument is there to conserve. Grass that's too high doesn't benefit the critters and neither do low quantities of forage and vegetation. Grazing is used to reach that happy medium, but the grass doesn't necessarily need to be mowed every year or for very long. As time passed, Beck said he received fewer and fewer phone calls from the BLM to turn his cattle out to pasture. And the economics of keeping cattle just stopped making sense. "I'm not in the cattle business anymore," he said. "In fact, one of the reasons I left is because of the way the government treated their land, and I'm not mad—that's just the way it is." Beck's outlook is that change is life's only constant, and he said he feels fortunate to have made adjustments that enabled him to continue working in agriculture. His family eventually sold their land out on Highway 58, and now he grows grapes in Creston. But at the time when everything was shifting, he said he was disappointed in the way he felt he was treated. It was a handful of ranchers against a majority that saw longtime agricultural families as "benefactors" using the land for their own gains. "It frankly got discouraging after a while," he said. "The monument did affect people like me." Although the BLM takes the lead on managing the monument, it's something that's done in partnership with the Nature Conservancy, the state Department of Fish and Wildlife—both of which still own land within the boundaries of the monument—and various other stakeholders. "The plan was always to collaboratively manage the Carrizo Plain," said Scott Butterfield, an ecologist with the Nature Conservancy. "It's a really long process to go from unprotected status to national monument. ... And for someplace like the Carrizo, lots and lots of stakeholders were involved in that process, and it was a pretty public process." It took about eight years of public meetings to hash out a management plan for the monument that everyone could agree on (although, Butterfield said, not everyone was 100 percent happy with the outcome). That plan was finally put into place in 2010—laying any lingering controversies to rest. The half-dozen cattle leases that existed before the monument was created were allowed to continue, just as the 18 existing oil leases were. Designating the Carrizo as a monument banned any new leases from taking shape after 2001, and the management plan takes that into account. Whoever owns the mineral rights on those oil leases can technically continue developing those leases. In 2014, the BLM approved an application for oil exploration on the Russell Ranch Oil Field on the southwestern edge of the monument in the Cuyama Valley, according to Jeff Kuyper with Los Padres ForestWatch, a group that keeps an eye on the Central Coast's public land. He said the oil company ended up not conducting any of the oil exploration it applied for. "They never pan out," Kuyper said, alluding to a much more public attempt from Vintage Production (a subsidiary of Occidental Petroleum) to explore for oil on a 5-mile stretch of the valley floor near Soda Lake Road in 2007/2008. Both efforts proposed using seismic-testing equipment to essentially thump the ground to look for oil. Many of the animals that call the monument home live underground, including threatened (but not endangered) species like the burrowing owl. If you look at maps of oil wells that were drilled where the monument is now, historical attempts to find petroleum on the valley floor came up empty. Those wells are all capped, according to the Department of Oil, Gas, and Geothermal Resources (DOGGR), which falls under the California Department of Conservation. DOGGR's Well Finder database shows that there are 13 oil wells currently producing oil on the Carrizo Plain National Monument and two on the border. They are in the southwestern corner on two oilfields: Russell Ranch and Morales Canyon. Department of Conservation spokesperson Donald Drysdale said there have been attempts to find oil on Carrizo since the early 1900s. There is a plethora of oil being pumped out of the ground just outside the Temblor and Caliente ranges, which frame the monument. "From what I understand, there's no one champing at the bit to start drilling there. There have been oil companies interested in that area in the past, but there's no guarantee of finding much," Drysdale said. "The area was designated as a monument in the early 2000s; oil production in the region dates to the early 1900s. It seems reasonable that if there was a significant amount of oil to be had there, you'd see a lot more plugged wells on the map." Before the Carrizo was designated as a national monument, former U.S. Rep. Lois Capps (D-Santa Barbara) put forth a bi-partisan bill to create the Carrizo Plain National Conservation Area Act of 2000. Former U.S. Rep. Bill Thomas (R-Bakersfield)—whose district contains one of the largest oil fields in the U.S., which butts up against the western edge of what is now the monument—was a co-sponsor of that bill. That piece of legislation never passed, but it also specified that those existing land uses be able to continue. Thomas' successor and former aide, Republican Kevin McCarthy, didn't respond to New Times' requests for comment about the Carrizo Plain. But he did release a statement on April 26 after Trump signed the executive order directing Zinke to review certain monuments. JUST A PUP A San Joaquin kit fox pokes its head out of its mother's underground den. It's one of four animal species on the Carrizo Plain that are state- and federally listed as endangered. "President Trump and House Republicans will work to offer a defense against future executive overreach and bring a necessary dose of common sense to public land and policy," the statement said. "Local control is not only better policy; it respects the American people who can get along just fine without a distant government controlling their lives." If the Carrizo Plain National Monument lost its designation, the land would remain in the federal government's hands, as most of it's owned by the BLM. The monument's management plan would no longer be valid, though, and the endangered species would lose a layer of protection, Kuyper said. The worry, for him, is that the land could potentially be transferred to the state, which doesn't necessarily have the funding to manage large swaths of land. Even more worrisome, he said, is that the land could then be sold to the "highest bidder." No matter what, there are protections for endangered species in place under the federal Endangered Species Act. How that act gets implemented can sometimes depend on local agencies. Threats, such as the more than 300 marijuana grows that recently popped up in the California Valley, exist directly outside of the monument's protected boundaries. Those grows have resulted in direct losses of endangered species and their habitat, according to state Fish and Wildlife officials. Much of that land falls under SLO County's land-use jurisdiction. Currently, the county isn't requiring mitigation or informing growers of what's needed to help mitigate for and prevent some of those losses. On the Carrizo Plain National Monument—on federal land—protection of those species and that habitat is the ultimate goal. "Who would have ever thought we'd be fighting over whether or not Carrizo should be a national monument," Kuyper said. "I just think it's important for everyone who cares about the plain, whether they've visited or not, to get involved." Editor Camillia Lanham is awash in a rainbow of flowers. Send comments to clanham@newtimesslo.com. Participate in the public process by sending your thoughts on the Carrizo Plain National Monument to the Department of the Interior. Comments on the review of the monument’s status are due before July 10. Visit savethecarrizo.org or regulations.gov to learn more about how to do it.